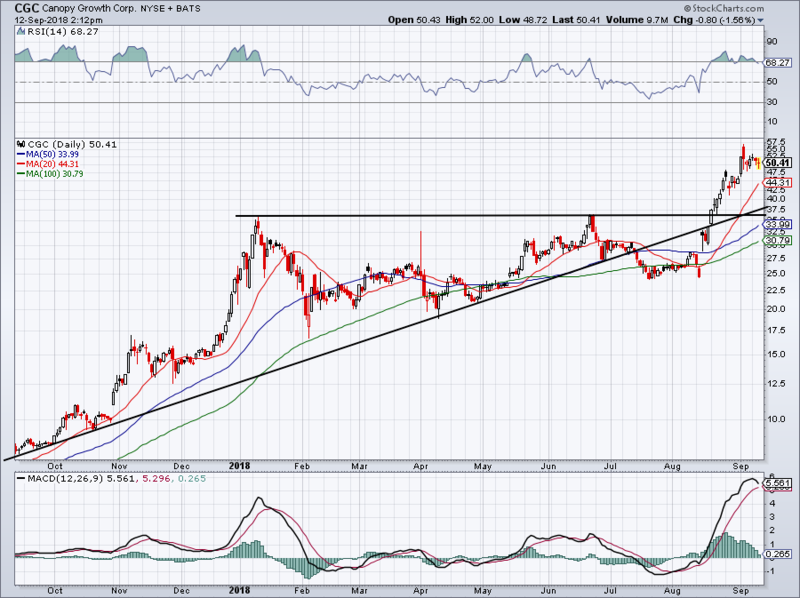 Pot stocks like Canopy Growth Corp (NYSE:CGC) have been on absolute fire lately. Are pot stocks becoming the next crypto-craze, dare we say? I don’t know if I’d go that far with Canopy Growth stock, but its ascent has surely attracted plenty of attention. Shares now command a market cap of (wow!) $11.3 billion. That makes it notably more valuable than several well-known companies. It’s larger than Box (NYSE:BOX), Twilio (NYSE:TWLO), BlackBerry (NYSE:BB), Dropbox (NASDAQ:DBX) and Qorvo (NASDAQ:QRVO). It’s roughly the same size as Macy’s (NYSE:M) and is almost the size of Chipotle (NYSE:CMG)! Tilray (NASDAQ:TLRY) has a market cap of about $9 billion and has been on fire as well. While GCG stock is up a whopping 77% over the past month, TLRY stock has scorched higher by more than 300%. These gains are insane, particularly when we look at the fundamentals, which we’ll do momentarily. But it brings up a great point about market psychology and momentum. Sometimes when a stock is hot, it doesn’t matter what it’s fundamentals look like. This can be true on big declines for good companies too, but generally speaking, these low-float, smaller companies can ramp like mad without seemingly any reason why. Yes, marijuana is quickly gaining legalization throughout the U.S. and North America. And surely, that could mean big things for companies like Canopy Growth and Tilray. Be it from a medical perspective, recreational perspective and more. But to juice these stocks up to $10 billion entities on essentially just hope makes it eerily reminiscent of bitcoin, ethereum and other crypto stocks that have gone up in smoke this year. Shares of CGC stock are being bid up on two things: momentum for a strong-performing stock that’s up 500% over the past year, and on blind optimism of what the future of pot will have on society. Even if Canopy Growth stock blooms into what some hopeful bulls are praying for, how much upside could be left now that they have been bid so high? Thanks to the momentum players in the market, they could take Canopy Growth stock up another $10, $20 or $50 per share before it blows out. There’s really no accurate way to know. One thing I do know is that the valuation is incredibly stretched. In 2017, Canopy had revenues of just under $40 million, through two quarters of this fiscal year, sales are around $47.5 million. That growth is obviously pretty impressive, topping last year’s sales in half the time. If CGC can build on that momentum, perhaps it will churn out $100 million in sales. What great growth! That means it trades at 110 times this year’s sales though, an unsustainable figure. A lot of investors have been piling into Canopy Growth stock, Tilray and others after Constellation Brands (NYSE:STZ) made a $4 billion investment in CGC. While I agree that Constellation’s move, which comes from an excellent management team, is a vote of confidence in both CGC and what’s to come in the cannabis market, others have pointed out that the deal has made Canopy even more expensive. Some argue that CGC is now being valued north of $17 billion as if the prior valuation weren’t bad enough. I am not anti-cannabis, anti-Canada or anti-Canopy Growth. There are clearly positives tied to all of these things. But I simply cannot get behind CGC stock at these prices with this valuation, even under a rosy outlook. In any regard, Canopy Growth stock surely has been a hot trade. Fundamentally sound or not, 500% gains are 500% gains. So what does the chart look like now? Shares were definitely extended earlier this month, but have been settling down. Still, a correction into the mid-$30s would make CGC much more attractive to bulls. It will likely find moving average support from the 50-day and 100-day if that decline does materialize. Also worth pointing out is that the 20-day could give Canopy Growth stock a boost. If it fails too, look for a decline into stronger support. Bret Kenwell is the manager and author of Future Blue Chips and is on Twitter @BretKenwell. As of this writing, Bret Kenwell is long BOX. The post Wait for the Next Big Correction to Jump on Canopy Growth Stock appeared first on InvestorPlace.